Many things have changed in the American diet since the Nutrition Facts label was introduced 20 years ago. The Nutrition Facts Label, introduced in 1993, helps consumers make informed choices and maintain dietary practices. The Food and Drug Administration (FDA) is proposing to update the Nutrition Facts label found on most of the food packages here in the United States. People today are eating much larger serving sizes than they did years ago. According to the director of FDA’s Center for Health and Safety and Applied Nutrition, Michael Landa, “Obesity, heart disease and other chronic diseases are leading public health concerns.” The proposed food label changes plan to bring greater attention to serving size requirements and calories. In addition, the proposed changes include requiring information about “added sugars:” Many experts recommend consuming fewer calories from added sugars because they can decrease the intake of nutrient-rich foods while increasing caloric intake. Another change proposed is to require manufacturers to declare the amount of potassium and Vitamin D on the label. Calcium and iron would continue to be required; however, Vitamins A and C would now be included on a voluntary basis. Food serving sizes will get a reality check. The proposed changes include changing the serving sizes requirements to adequately reflect how people actually eat and drink today. In the U.S., serving sizes have changed since they were introduced 20 years ago. By law, the label information will be based on what a typical person actually eats, and not what they “should” be eating. Serving sizes will be more realistic and reflect how MUCH people eat at one time. 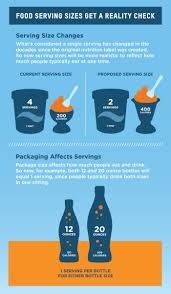 Furthermore since package size affects how much a person eats and drinks, under the proposed changes, food packages will be required to label as one serving the amount that is typically eaten at one time. Currently, the label states the number of servings in the package. For example in the future, a 20 ounce soft drink that is typically consumed in one sitting would be labeled as one serving. So, under the changes, both a 12 and a 20 ounce bottle would equal one serving, since people usually drink the entirety of either of those sizes in one sitting. Calories and serving sizes will be more prominent on the newly proposed label. This is highly important in addressing public health concerns for obesity, diabetes and cardiovascular disease for our nation.